As in past years, our highest-scoring losing teams in the first round get a second chance at the playoffs as “wildcards.” The total number in the field determines the number of eligible schools. 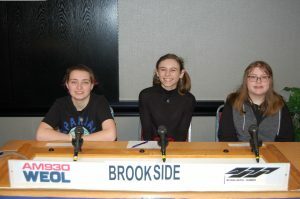 This week’s program presents two wildcard teams, Sheffield’s Brookside High School represented by, as pictured left to right, Dakota Rabineau, Lucia Morello, and Kassie Brooks, and the team from Lorain’s Clearview High School, left to right, Sierra Hitchens, Nathaniel Suprun, and Thomas Rivera. 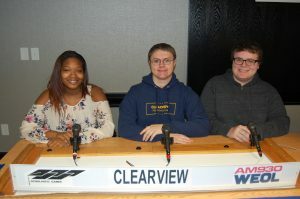 Surprisingly, Clearview’s score from last week’s program bumped another team from wildcard status prompting the school’s return for the first playoff program. The winner of this contest will return again next month as quarterfinalists. Click above to hear the competition. To read the final results, you can click to see our official news release. In another qualifying playoff, the team with the highest losing score will compete against team with the lowest winning score and that winner, to be determined in three weeks, will become the last quarterfinalist.